Screenshot of the voting results for the Second District. A grassroots effort to shed light on how state legislators vote in Sacramento and whether or not those votes are reflective of their constituencies has yielded the People’s Report Card of California, an inaugural window into State Senate and Assembly members’ performance on what the group’s organizers deemed key issues for Californians. The report was put together by the Courage Campaign, a member-group of a larger coalition of California “watchdogs” that seek to hold legislators accountable for their votes at the State Capitol. Its “courage score” ranked state lawmakers by their votes for or against 25 bills last year that ranged from bulking up climate change policies to social justice issues like creating a system to document and prevent racial profiling by law enforcement and closing the gender pay gap. Those democratic lawmakers found to be voting against their constituent’s interests—a measure they determined by cross referencing ballot results on similar progressive issues—were given negative scores with the bottom 12 law makers making it into the Courage Score “Assembly Hall of Shame” for their perceived choosing of corporate and contributor interests over their constituents. Listed among that dozen are two who represent Long Beach, Assemblymen Patrick O’Donnell (District 70) and Mike Gipson (District 64). Kurtz said this distinction is significant because unlike a congressional vote, the number of votes needed in the Assembly to pass or deny a bill does not fluctuate based on how many lawmakers are present. For instance, a seven person committee would need four votes to pass a bill through regardless if all seven are present. Kurtz did note that the Hall of Shame was not a place for the worst lawmakers in the state—many republican members of the Assembly and Senate received zeros—but O’Donnell’s and Gipson’s courage scores of 41 and 53 respectively earned them Fs on the group’s scale and placed them in the bottom percentiles of democratic lawmakers in the state. The scoring was more nuanced than just assigning four points to each of the 25 bills they chose as a measuring stick of courage. The group analyzed every vote taken at the committee and floor level on multiple readings to decide whether or not a vote was made in honest support of a bill or if it was cast after a bill was passed or watered down. They also made outreach efforts to those lawmakers who made it onto their HOS list. In one case they found that Assemblyman Das Williams, who represents the 37th District, missed two of the votes measured by the group because his wife went into labor during the last day of the assembly session. However, for the others on the list, including O’Donnell, those conversations yielded no clear answers for why so many abstentions were taken. O’Donnell did vote in favor of a majority of the bills the group used to decide its scores, including those requiring double-time pay for working on Thanksgiving, protecting grocery workers from being fired after changes in store ownership and other workers’ rights bills, including the most recent move to boost the minimum wage to $15 per hour by 2020. But he also voted against a measure that would have required due process before people’s belongings could be seized under civil forfeiture laws and abstained on nine others involving providing equal pay for women by eliminating prior salary disclosures and protecting patients from unexpected out of network charges. These votes and non-votes helped place him as the Courage Campaign’s 43rd most progressive legislator, putting him in the bottom 10 among Democrats in the state. 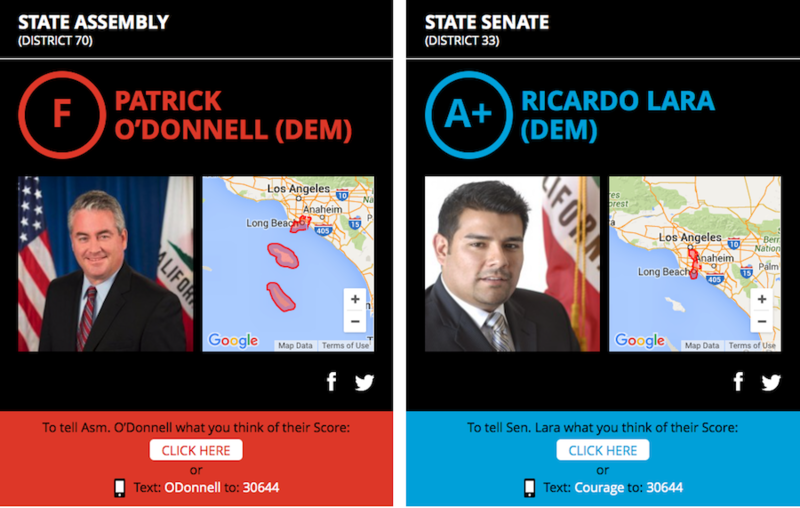 Two other Long Beach lawmakers, Senator Ricardo Lara and newly anointed Assembly Speaker Anthony Rendon both were awarded perfect scores by the Courage Campaign. So what could fundamentally change the voting patterns of four men representing portions of the same city? Campaign contributions, according to the group’s analysis. The formula for their analysis included a three-pronged approach in which they not only weighed the voting record of the lawmakers, but also those ballot initiatives voted on by the people they represent and the groups that provided financial backing for those lawmakers. It noted that Long Beach voters overwhelmingly supported Proposition 47 (reduced non-violent felonies to misdemeanors), Proposition 36 (repealed the three strikes law) and Proposition 39 (the Clean Energy Jobs Act) which indicated a much more progressive voter base. For Gipson, O’Donnell and many others in the Hall of Shame, groups tied to oil, gas, insurance and telecommunications topped the donor lists. O’Donnell in particular received nearly $80,000 in direct donations from unions, physicians, insurance, real estate and telecommunication groups, but nearly 20 percent ($12,988.95) of that total came from the energy sector according to the group’s financial analysis. Kurtz also pointed out that Sempra Energy, a parent group to SoCal Gas which was responsible for the Porter Ranch disaster, recently gave $3,800 to O’Donnell ahead of a vote on Senate Bill 380, which would require an immediate moratorium on any further gas injections into the Aliso Canyon reservoir and would restrict productions in older wells. Kurtz said it was the the failures of the environmental bills SB 32 and 350, the latter passing in a weaker form, that spurred his group into action, because he said they felt they weren’t doing enough to hold politicians accountable nor keeping the people they represent connected to what happens inside the bureaucratic bubble of Sacramento. The group is holding a rally this afternoon in Los Angeles in front of the Southern California Gas Company executive offices where it will have speakers from areas represented by members of the Hall of Shame that will explain how their votes in the assembly went against the will of the people. The press conference is part of a wider effort by the group to inform communities of their assembly members’ “shameful” representation including online ad buys which will circulate digital billboards of the legislators and their Hall of Shame card. “We hope to get this story in front of people all across the state to number one, check out the website and see if their representative is doing well or not, and if they’re unhappy with what they find there, we’re hoping they tell their friends and neighbors to take action and give the legislator a piece of their mind,” Kurtz said.